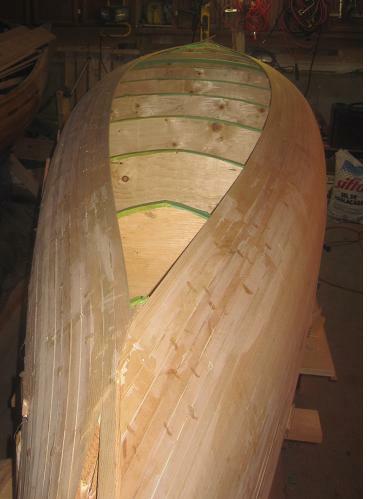 At long last the canoe is at the point of the build called the football. At this point it’s advisable to measure from the edges of the strips to the center of the forms to make sure that everything built up evenly. If something is off, this is the time to adjust for it. Fortunately, this build treated me well and everything was even. Many builders choose to fill one half of the football with arcing strips, cut along the center line and then fill the other half. The method I prefer, partly because I can’t trust myself to cut a straight line, is to run a pair of strips down the center line and then fill the halves. In the past I’ve used this technique to alternate light and dark strips that run the length of the football. To people who haven’t seen me in a canoe, I call these racing stripes. This time, I’ll try something a little different. Less racing. More zen. Stay tuned. The following picture shows the pair of strips run along the center line and the use of bungee cords to keep the strips tight against the forms. The picture below contains a couple of items that I want to touch on. The first is the inset of the bird, done in a darker cedar than the surrounding strips. Besides being an attractive feature, the inset effectively integrates joints into an overall design. The fact that grain and color don’t match (a concern when joining strips) becomes desirable. 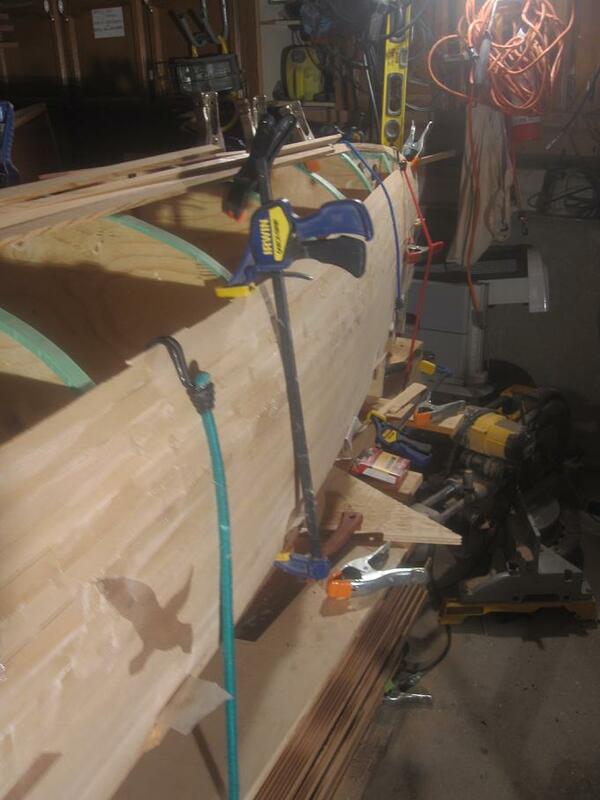 In this way, I’ve been able to do most of the sides of the canoe without obsessing about how good the joins look. The picture below also shows the use of 1/4″ dowels to protect the coves of the strips when clamping, and the use of both clamps and bungee cords to press the strips together. As the stripping continues, the clamps eventually become too short (or the curve of the hull makes their use impossible). At this point, I use bungees and either wind them around the assembled strips or hook them from the newly-installed strip to the base of the strongback. 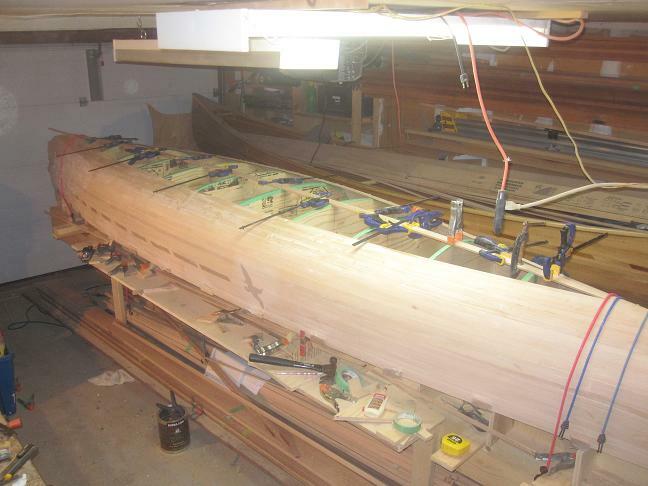 You are currently viewing the archives for February, 2013 at greybeard canoes & kayaks.